Mouse In The Manger in Frankfurt Book Fair. Mouse In The Manger was prominently displayed at the Independent Book Publishers Association booth at the Frankfurt, Germany Book Fair! The Frankfurt Book Fair is the largest global marketplace for books, media, rights, and licenses worldwide. The 2015 fair took place October 14-18, 2015. You can see Mouse In The Manger on the front corner, second row up on the right. One weekend we did a round the island tour. On the western shore and off the beaten track was the City of Refuge. Now a park, it was the site where, up until the early 19th century, Hawaiians who broke a kapu (taboo or law), could seek refuge inside a 10 ft high, 1000 ft long stone wall made of lava rocks. Commoners who got too close to the chief or touched his belongings, or even let their shadow fall where he was walking could be put to death! It was thought that these offenses angered the gods. The offender would be absolved by a priest and was then free to leave. Defeated warriors and non-combatants could also find refuge here during times of battle. Betty and I were intrigued by the ancient Hawaiian tiki gods that were supposed to protect the site from intruders. There were also times when they demonstrated making dugout hulls for the outrigger canoes. There was an ancient stone table with Konane, the Hawaiian checker game. Pieces of white coral and black lava fill all the shallow holes in an alternating pattern. the object, like checkers, is to jump the opponents pieces and remove them until one player can no longer jump, and is the loser. I loved to play checkers when I was a kid. My Dad and I played until I beat him, and then we switched to chess. I was Checker Champion in Junior High School. Mouse In The Manger is a Finalist in the Florida Writers Association Royal Palm Literary Award competition in the children’s picture book category! Winners will be announced at the banquet in Orlando, Saturday night, October 17th when we will find out if we come home with an award. Every year, there was a parade through town for the week long Merrie Monarch celebration. One of the biggest parades in Hawaii – the parade had “only in Hawaii” style floats. Pa’u riders were a big hit! Wahines, including the parade queen, wearing long colorful gowns, rode astride on horses bedecked with flowers and leis. There were high school and military bands and color guards. It was a comedy band, and we were to have some semblance of a military uniform and be able to make noise with an instrument – actually, a few kids could play, there was a trombone and clarinet, and we marched to one of John Philip Sousa’s marches. I borrowed a drum, and got some military ribbons to put on a Scout shirt, and my umbrella hat. Al and I were the drum row. A couple of the college kids had uniforms from relatives who fought for Japan in the war. We actually practiced once. Al said that was enough, he didn’t want us to sound too good! The band was a big hit in the parade! I still marvel that I could walk that far with a drum bumping my leg – and NO CANE! In addition to the parade, The Merrie Monarch celebration, honoring King Kalakaua, had a Hawaiian art fair, an international hula contest, and a ukulele playing contest at the Palace. In the small town of Hilo, with few rental properties, we felt “lucky” to get an apartment at the Low Apartments across the street behind the Hilo Hotel close to downtown. The second floor walkup apartment had a large bedroom with an easy chair and bed, and a large unfurnished kitchen. We bought a card table, and borrowed four folding chairs from school. This was the first of the series of amazing housing situations we experienced in Hawaii. We met the manager of the Hilo Hawaiian Hotel, who invited us to come to swim in the hotel pool. As we swam, we were entertained by the poolside lounge piano player, Randy Hongo, who turned out to be one of my students at the college, and who the Lord wanted us to meet for a reconnection six years in the future. Randy surprised us by leaving a bouquet of orchids on our doorstep as a gesture of Aloha. Randy’s family owned an orchid farm. Welcome to Hawaii! Al Yonan introduced us to Norm Westly, who sold us insurance for the 1957 Chevy we bought. Again, providential to meet Norm, who we would connect with again for a life-changing episode six years later. Hilo was a quiet small town along Hilo Bay protected by a seawall. In 1960, only five years before our arrival, the downtown was destroyed by a massive tsunami caused by an earthquake off Chile. In the restoration, much of the waterfront was designated as parks or memorials. Seemed like everybody wore colorful aloha shirts. Public transportation was provided by private sampan buses – jitneys made of a pickup truck with benches and a roof over the bed. Kids surfed just outside of town beyond the harbor entrance through the seawall. There were two movie theaters, the Mamo, showing foreign (Japanese) and art movies, and The Palace, where Betty and I went for current American movies. I wanted to absorb as much local culture as I could so we bought aloha shirts, and I bought an inexpensive ukulele at the store for $40 – later found out it was a special Kamaka Uke that is the best of the best and now worth hundreds of dollars as a collector’s item! I tried writing some Hawaiian style songs to sing with my ukulele. Interesting that the “Big Island” of Hawaii has only a few public beach parks with reef-protected swimming. Hapuna was one of the favorite beach parks with a pavilion, and was the site reserved for an overnight new student orientation. Since we were new faculty, all we had to do was show up, and camp overnight on the beach while the students slept in the pavilion. However, Hapuna was on the other side of the island from Hilo, and we had no camping gear. With my Scouting experience, sleeping on soft sand seemed like a piece of cake, so we borrowed a tarp and a poncho, and set off for Hapuna. The drive up the island Belt Highway past cane fields and small villages, and then through an incredible rain forest of tall trees, was beautiful! We emerged from the forest unto rolling ranch land with a few small ranches, and then passed Parker Ranch headquarters before the slight descent to the beach on the eastern shore of the island. At that time Parker Ranch was the largest single-owned cattle ranch in the United States, with much of it open range. The backdrop for the ranch was Mauna Kea, rising 13,796 ft above sea level. Betty and I spread the poncho on the sand under some protruding tree branches, and the tarp over the branches, and plunked down for the night. So much for Scouting experience. Sleeping on the beach next to the Pacific Ocean is cold; sand is hard; and we discovered little scorpions in the sand around us in the morning. We’re glad God protected us from any stings. It’s a long way from Pittsburgh to Hawaii, so we stopped overnight in San Francisco to rest, and I could meet Betty’s aunt Louise. Then the second long flight to Honolulu the next day. We arrived in the early evening. When we climbed down the steps from the plane, there was a heavy thick fragrance of plumeria in the air! Welcome to paradise! We took a cab to Waikiki and checked into the Reef Tower, a block from the beach. When we got to our room, I became nauseated! I had to lay down! What was happening? Mel Haney, the son of a neighbor farmer in Michigan, who lived in Honolulu, was to pick us up shortly to go to dinner. Thinking something to eat might settle my stomach, Betty got me a pineapple boat of fruit. As soon as I ate the fruit, like “magic”, I was fine! I called my empty-stomach nausea the “Waikiki Whoops!” Mel came and took us to the Tahitian Lanai for dinner. Next day, Mel took us on a tour of Honolulu, including Punchbowl Cemetery. The cemetery is a memorial garden where soldiers were interned from WWII in the Pacific. We drove to the lookout point which had a beautiful vista of the whole city from Diamond Head to Pearl Harbor. We ended the day at the Halekulani Hotel lawn for a Hawaiian concert. 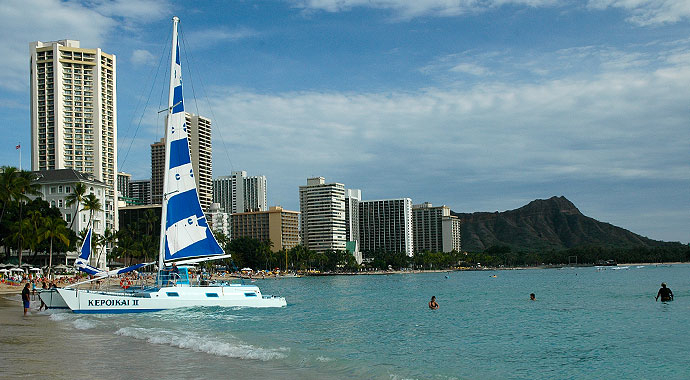 The second day, we walked to the beach, and I talked Betty in to going sailing on a catamaran off Waikiki. It was a fun and exhilarating time! On the third day, we took an evening flight to Hilo on the “Big Island” where I’d be teaching at the University of Hawaii Hilo College. Al Yonan, my boyhood neighbor in Michigan, and his wife Suzy, met us at the small Hilo airport. As we approached them, a girl ran out of the shadows, put a flower lei around my neck, kissed my cheek, and then disappeared as quickly as she had appeared. Wow! That was the real traditional Hawaiian welcome! Al and Suzy gave us more leis, and Al said the greeting by the Wahine was not pre-arranged, and he didn’t know the girl. Dinner at Yonans, and then on to the Lanai motel on Banyon Drive which curved through a park on Hilo Bay. “Oh, by the way”, Al told us, he had signed us up to chaperone an overnight Freshmen students orientation at a beach park in two days. Hmmm … sounds like it’s going to be an interesting way to start our Hawaiian honeymoon!